I think I will start a series…. 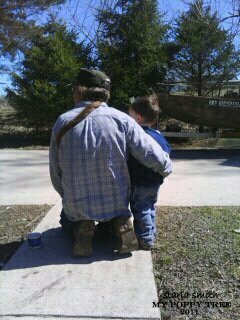 A BOY AND HIS GRANDPA!!! I told you about my Dads imagination, his ability to get into kid character. We went to visit this past weekend. My son was very, very excited. He lets my son choose the way. Be the boss. Be in the drivers seat…..to tell the story. For a few hours of the day they were inseperable…walking through my Dad’s little town, hanging out at the park, swinging and on the merry-go-round. Like two long-lost friends reunited. ‘Unrushed’ and young like me.